There is greater biodiversity in Africa’s Albertine Rift region where Virunga National Park is located than in any other ecosystem in Africa. 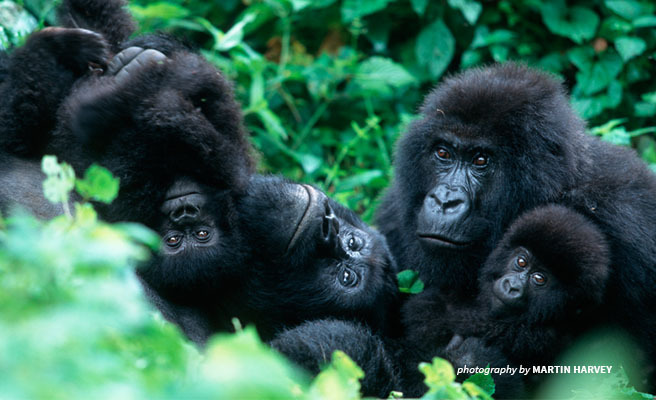 This richly diverse array of habitats is home to critical populations of the world’s last remaining mountain gorillas. 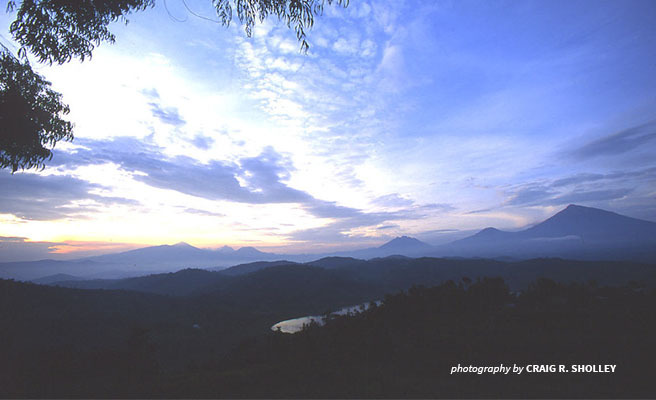 Along with its abundance of wildlife, Virunga National Park has an exceptional diversity of landscapes ranging from the glaciers of the Rwenzori Mountains, at over 5,000 meters, to impenetrable forests, savannas, rivers, and lake ecosystems. Virunga National Park lies in eastern Democratic Republic of Congo, but mountain gorilla habitat extends across country borders to southwestern Uganda and northeastern of Rwanda, covering over 790,000 hectares. The park’s magnificent volcanic mountain ranges and endemic species placed it on the UNESCO World Heritage List in 1979. Political insecurity, poaching, and resource extraction landed the park on the List of World Heritage in Danger, where the park’s status has remained since 1994. Political instability and pressure from rebel groups throughout the area has made Virunga a very dangerous place for decades. Park rangers risk their lives on a daily basis while protecting the park. Over the past 20 years, 160 Virunga rangers have lost their lives trying to protect this African jewel. The discovery of oil in nearby Lake Edward and Queen Elizabeth National Parks has raised the specter of oil exploration in Virunga and this also threatens the park. The oil is buried under a landscape where approximately a one third of critically endangered mountain gorillas reside. But there is good news. Mountain gorillas are seeing the benefits of strategic and concerted conservation efforts and consequently have experienced a steady population increase over the last 3 decades, making the mountain gorilla the only great ape species in the world to be increasing in number. Continued political instability, human encroachment, and forest degradation do pose real threats and there’s no room for complacency. With a population hovering at about 1,000 individuals, their future remains fragile and depends on further conservation efforts and local community involvement. The mountain gorillas are not alone in their reliance on the sanctuary of Virunga National Park. Many other endangered and vulnerable species live within the park’s borders, like the elephant and, numerous threatened ungulate species, and important hippo populations. Local communities rely on Lake Edward which feeds into the Nile. Oil extraction and possible oil spills would disrupt wildlife and the people living in this area. The loss of mountain gorillas and the subsequent loss of tourism dollars would put increased pressure on communities that rely on revenue from gorilla trekking expeditions. For example, across the border in Uganda’s Bwindi Impenetrable Park the money from gorilla tourism now exceeds the revenue from the mining and encroachment that nearly destroyed Bwindi 30 years ago. In a rapidly developing Africa, mining, agriculture, and human development are inevitable to support socio-economic progress, but they should be carefully planned. Where and how these activities take place should be carefully weighed against the repercussions they could have on wildlife, people and the important environmental services that places like Virunga provides. > Learn more about AWF's protection of other great ape species in key habitats. Craig's experiences with wildlife and conservation began in 1973 as a Peace Corps volunteer in Zaire. As an L.S.B. Leakey grant researcher in the late 1970s, Craig studied mountain gorillas with Dian Fossey and, in 1987, became director of Rwanda's Mountain Gorilla Project, of which African Wildlife Foundation was a sponsor. Craig has acted as Scientific Advisor for the award-winning IMAX film, "Mountain Gorilla," and with National Geographic, he surveyed the conservation status of mountain gorillas in the aftermath of Rwanda's civil war. Craig’s direct involvement with AWF began as a Senior Associate and member of AWF’s Board of Trustees. He became a full-time employee of AWF in 2001 and now serves as the organization's Senior Vice President.